I spent a good chunk of today re-jiggering the look and functionality of the comment system here on my blog. Using the WordPress Thread Comment plugin readers and myself can respond directly to other comments complete with e-mail notification. Gravatar is a globally recognizable avatar plugin giving everyone who posts their thoughts to my blog the option to show an icon representing themselves. If you don’t have a Gravatar account head on over to Gravatar.com to register your e-mail address. Finally, I installed WP-Chunk which simply minimizes long URLs posted in comments and prevents them from breaking my layout. But most importantly I re-designed the look of comments making them easier to read. I hope this will encourage more discussion on my blog and if you have any feedback, please leave a comment! P.S. 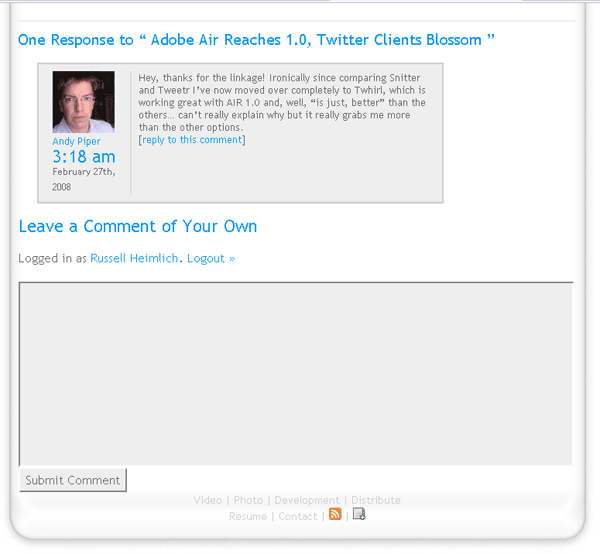 If you need a smattering of comment designs for inspiration check out the comment design showcase at SmileyCat.com. First! Fake. Shopp’d! Your mother. And thanks to the magic of comment threading, my uncouth derailment is shunted into its own stream of conversation! Still, I find I prefer a linear flow of comments with quotable anchored permalinks; years of staring at Slashdot and Scoop posts have given me the impression of a noisy crowded room when I see multiple threads ongoing. Agreed! But I didn’t have time to rework the plugin. There are a few things I would certainly like to change about it but that will wait for another weekend. Good blog. I got a lot of great info. I’ve been watching this technology for awhile. It’s fascinating how it keeps varying, yet some of the core factors remain the same. Have you seen much change since Google made their most recent acquisition in the domain?